This group of genera forms a paraphyletic grade between Aeromachini and the remaining hesperiine tribes in the combined analysis of Warren et al (2009). 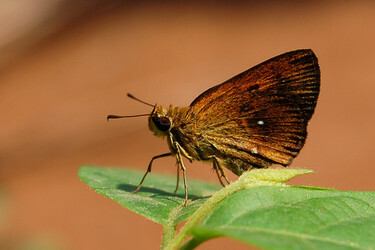 Almost all the genera occur in the Old World tropics, but the former New World subfamily "Megathyminae" (giant skippers, composed of Aegiale, Agathymus, Megathymus, Stallingsia, Turnerina) appears to be nested well within this group. Given the weak support for clades and relatively limited sampling to date, we have chosen to present these genera as an alphabetical list, pending further study. Page: Tree of Life Hesperiinae incertae sedis. Authored by Andrew V. Z. Brower and Andrew Warren. The TEXT of this page is licensed under the Creative Commons Attribution License - Version 3.0. Note that images and other media featured on this page are each governed by their own license, and they may or may not be available for reuse. Click on an image or a media link to access the media data window, which provides the relevant licensing information. For the general terms and conditions of ToL material reuse and redistribution, please see the Tree of Life Copyright Policies.